Like most field recordists I use the metering the manufacturers give me on field recorders, and that’s fine for most stereo and binaural applications. But it does have its limitations, particularly for mono compatibility. Unlike a studio situation in the field you are recording what is out there, the only thing you can change is your physical location and the direction you are facing. Des Coulam of soundlandscapes had the concept of the sound map and using that has helped me with with urban field recordings. With bird recording it’s simple – get as close as you can to the bird without disturbing it 😉 If using a directional microphone then you want to position the interference in the dead zone of the mic. Most people on the Internet seems to listen in stereo, there aren’t going to be that many PC users hooking the output of their audio card into their 1950s valve gramophone. So binaural urban field recordings are going to be fine because if anyone listens they will be listening in stereo and most likely using headphones, which is a great mix. You get decent results even from highly reverberant recordings like the South Kensington Station pedestrian tunnel. The trouble with binaural is you end up with a lot of out-of-phase signals, the classic ball of string on a goniometer studio display. With the pedestrian tunnel I tried to keep the busker central while recording, and this is serviceable in that recording. Nevertheless there are a few places where the ball of string stretches out horizontally, and mixing the signal to mono worsens the tone of the recording – the echo that was character now become colouration. They are higher in pitch, and they also aren’t in a horizontal plane. it was about 5m away in a tree, the vertical angle was about 45 degrees. Unfortunately the Telinga parabolic microphone system, in particular the DATmic also has this, because there is a baffle between the two stereo sides. One of the nice things about the Telinga is that you get the background in stereo and the wanted sound in mono. It was recording using a Telinga dish and DATmic at the WSRS Ennerdale field recording meeting. The bird was sitting on a phone wire just outside the bunkhouse, I was on the first floor so roughly level with the bird about 2m away aiming out of a window. It was a handheld, snatched recording – you have to seize the moment sometimes. And I probably let the dish drift slightly. Sitting at home I can hear the difference between the first part and the second part – the first part of this clip has better definition. But it isn’t easy to get this right in the field by ear alone. 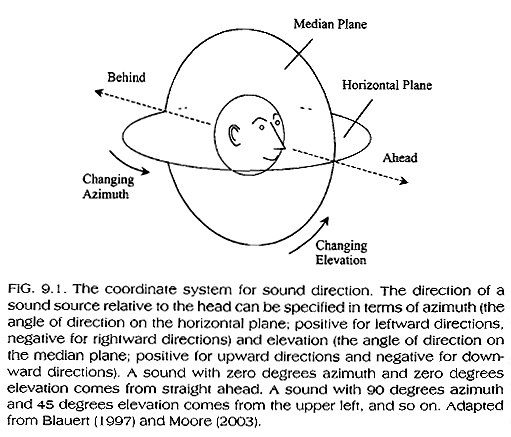 It appears that high-frequency stereo location above 1500 Hz is by intensity rather than phase – there seems to be some sort of phase-locking mechanism that improves low frequency discrimination by interaural phase. Which is just as well since low frequencies are masked less by the head. Although I knew that we use both phase and intensity to derive the stereo image I didn’t appreciate the frequency dependence. This is also used in MP3 encoding, so I need to learn more about that to be able to MP3 encode field recordings better – they would lend themselves well to joint stereo modes. This means I am sunk as far as getting the robin’s song in phase by ear. I’m just not going to hear it – I need some kind of gizmo to show me this visually. As to whether this is practically useful in the field is another matter. Birds have a nasty habit of moving, I’m guessing a robin won’t move enough while singing to pick up an extra 2cm path length, but I don’t know. The scope display is too much to tote around, while I do have a DS0203 digital scope, the user interface of that is fiddly and terrible. It’s acceptable on the bench and there are times you just need an isolated scope, but it would be maddening in the field. There are three other types of stereo phase display I know of. One is the sort of thing described in Westhost’s Project 135 – Stereo Phase Correlation meter. I’ve never seen one of these. At the BBC they tended to measure the sum and difference levels and display these. It’s possible to do that using a single LED display by running the L+R signal to one log display and the L-R signal to another, and using bicolour LEDs, green to the L+R and red to the L-R. If you see red then there’s too much out of phase data. The obvious place to start is with Rod Elliott/Westhost’s Project 135 – Phase Correlation Meter. It’s relatively simple and looks easy to make. Flock of Jackdaws with young in trees by playing fields and trees by the River Test in Whitchurch. The calls of the young from all around come out in this binaural recording. Binaural crowd recording from this Norwich cathedral centenary when the Sheriff was hosting a wine event.